March 1986: Mom and Dad Longenecker visit the families of my sister Janice and me in Jacksonville, Florida. 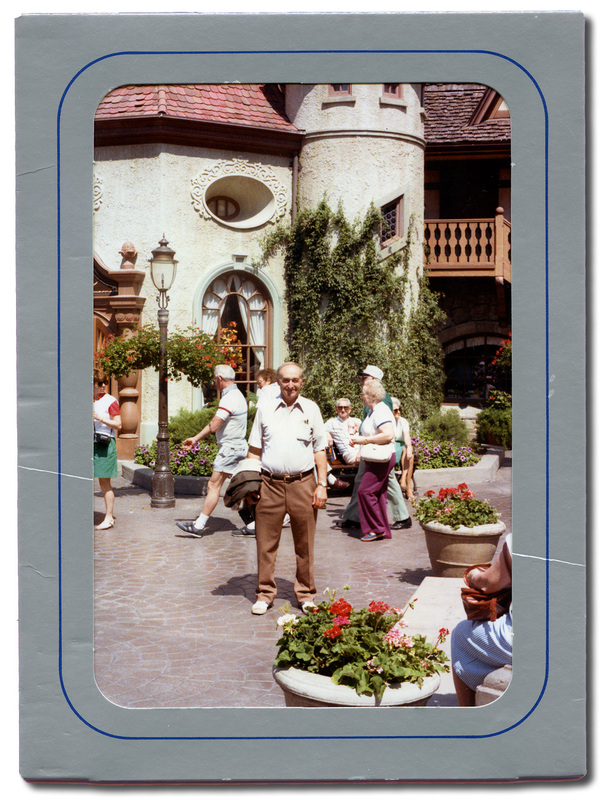 We all enjoy Epcot in Disney World, Dad’s chance to see a faux version of the Switzerland he never actually visited but planned to some day. My super-charged Dad seems more mellow now, slower, even takes naps. “Hey, Dad, I see you’re getting a pooch here,” says son-in-law Cliff, commenting on my dad’s weight gain as he playfully pinches his waistline. April 1986: We get a call from Pennsylvania, “Dad has been diagnosed with lymphoma. Blood cell tumors have developed in the lymphatic system. Stage 4 . . . it’s too advanced to operate . . . they can try chemotherapy, maybe radiation after that . . . .” Like an earthquake, the news sends shock-waves through our family. Why, we just saw him a month ago. May 1986: My father is now dying of lymphoma. I leave my husband and children and fly up to Pennsylvania, alone, to see him alive for the very last time. He looks nothing like my image of him in March. His skin, scorched red-brown from chemotherapy, reminds me of a starving Indian. He is wasting away. “I don’t want to live like this,” he says, calling a halt to the treatment. Too weak to climb to the upstairs bedroom, he reclines now almost motionless on the pull-out bed in the living room, a solitary pillow under his head. On May 17 his 71st birthday comes and goes. 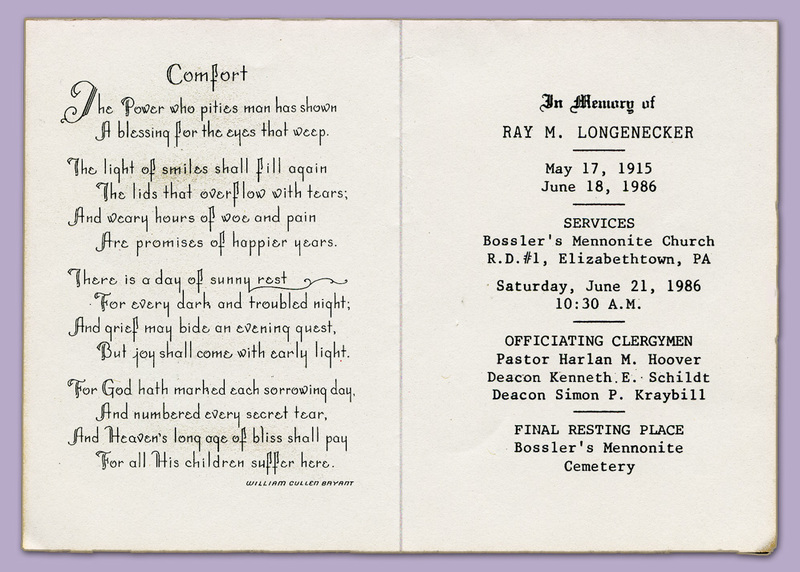 June 18, 1986 Daddy breathes his last, less than three months after his cancer diagnosis. We get the dreaded call and make plans to drive north for the funeral. My mind flits around in reminiscence. And then leaps forward with prediction: Now Dad won’t be attending the ceremony where I receive my Master’s degree in December. He won’t stand up to be photographed at any of his grand-children’s weddings or get to play with his great-grandchildren any more. At age 71, he has reached his heavenly home. Had he lived, he would have turned 100 years old this year, like Aunt Cecilia. 1. Love of nature He went on walks in the wide meadows and sun-dappled woods close to Rheems, PA on Sunday afternoons. Sometimes I went with him. 2. Love for music He played a banjo, guitar, and piano with gusto and bought me a violin. Music has formed the sound-scape of my mind since then. 3. Intellectual curiosity He perused US News and World Report and The Wall Street Journal, listened to Edward R. Murrow, Paul Harvey, and Lowell Thomas, engaged in conversation about world events. 4. Value of hard work There was the tomato field, the sweet potato plot, the shop . . . .
My father’s deep faith in God included honoring his own parents. Thank you for your thoughts on Father’s Day 2015. You always make the conversation richer! “…and bought me a violin. Music has formed the sound-scape of my mind since then.” I think you wrote about this once, too, didn’t you? I love that he bought you a violin and what a beautiful tribute for this Father’s Day weekend. I’m sorry he missed so many of those special times and being with grandchildren during important moments and events. You are right. Melodie, I did write about Dad’s musical inclinations in “Yodeling and Four-part Harmony” some time ago. You have a sharp memory. I accept both your appreciation and condolences. A lovely tribute to your father, Marian. I’m glad you have such good memories (as well as the sad ones). My father and my husband’s father both had lymphoma, although both died from other causes. I often wish my dad had lived to see our girls grow up–he would have been so proud of them. One consolation – these remarkable genes pass on to their descendents extending the legacy. I guess we can’t live in the land of regret – just be grateful for the gifts bestowed AND for the privilege of acknowledging them here. Thanks once again, Merril. At a certain age it seems most of us have lost our fathers and have memories to share. Thank you for taking the time to comment here because I believe you are traveling back to Canada this week! The needlework has been hanging above that door for as long as I can remember. I believe it came from my great grandmother Mary Horst Martin to Grandma Longenecker obviously on my dad’s side of the family. Thanks for the mention here, Bertha. Marian, I share your sadness on Father’s day and also on Mother’s day. Our parents are two of the most important people in our lives, teaching us, loving us, and the first people we stand up to. I hope Sunday will be filled with happy Father’s Day thoughts for you. I caught those words “the first people we stand up to” – yes, indeed. Mom and Dad help us shape a world view which we can both challenge or accept. Best wishes to you and Bill too this weekend. Marian — A beautiful, beautiful tribute to your father. Clearly he was a positive, uplifting, constructive, and healing influence in your life. My father and I did not always see eye to eye, but as the poet Whitman has said (and I paraphrase) I have learned great lessons from those who, like my dad, disputed the passage with me. He had the best of intentions and was consistent through my growing up years. That’s why I can express my gratitude here. When I gazed at this commandment as a child its message sounded solemn and ancient like from a distant ancestor or from Moses. Now it simply sounds wise. Thanks for lingering here, Dolores. Long days…long ways, inspired by our parents. Oh, Marian, when I read the line about how different your image of your father was in such a short time, I nearly cried. My dad did not suffer with lymphoma but with Alzheimer’s, and though it lasted 7+ years, at the very end, in a span of two months, his image changed drastically, and the pain was intense. This Father’s Day–and every Father’s Day–I miss the man he was before the confusion and anger and pain. And every year I’m blessed with fresh recollections of sweet memories I’d forgotten, and I feel so blessed. Blessings for new sweet memories for you, too, Marian. I often find commiseration and empathy in your comments here. We both have trodden similar paths which point to the incontrovertible truth about the fragility of human condition and our ways to cope and make sense of it all. Thank you for your reminder to focus on our blessings of this bittersweet time. That’s what I plan to do. It’s the healthiest attitude, isn’t it? Hugs to you too, Marylin. What a heart warming post on this Farther’s day . I lost my Dad ten years ago , and it feel like I only saw him yesterday . He believed in making the most of each day and enthused in the joy of family . ‘About time we had a get together’ he’d say with a cheeky grin I’ll never forget. I always loved music and when I was thirteen my Dad bought me an acoustic guitar. He just left it on my bed …I was so exited but to this day I have never learned to play it . It sits in the loft room of my house ,and just half a mile down the road , I have seen an advertisement outside a cottage for guitar lessons . I might make this my autumn challeng to learn to play my guitar . We’re never to old to learn anything are we Marian . Happy Father’s Day memories . Of course, you are never too old to learn. Besides, what a perfect way to honor that fine Dad of yours. Thanks for sharing your Happy Father’s Day memories. I always look forward to your telling stories from your own experience that match the theme here. Cherry … I agree with Marian. It’s time you dusted off that guitar and learned to play. Your Dad did give you a great gift. I miss hearing my Dad play his guitar. Even years later, it is hard to be without the father you loved so much, isn’t it. Even though it isn’t Fathers’ Day here in Australia until September, I often think of my dad and thank him for what he taught me. He left us two years and three days ago. We are fortunate to have had dads like those we had. Father’s Day in September! With blog friends literally from around the world my readers and I get to learn about other traditions like yours. Comments from the post this week come from other hemispheres (you and Australia and just below, Susan in South Africa) and other continents. I am so honored that we can gather here for stimulating conversation. My condolences to you and your family on the loss of your dad. Two years is really not that very long ago. Precious memories – glad you have them too, Linda. Thank you Marian for this profound post to your father. I’m remembering mine this day and can see him as clear as day. Our fathers were of such a different generation as they were children of the Victorian age, whose parents fought in WW1 (and possibly lost their lives) & our parents also fought in or experienced WW 2 which we never had to do. Here’s to fathers everywhere and our gratitude to those who taught us valuable life lessons. Yes, our fathers came from an age with high moral standards and lives lived sacrificially. Here’s another chance to honor them. I wonder whether Father’s Day is celebrated this weekend in South Africa. Linda (above) noted a different month for celebration in Australia. Yes it is Marian. I took my husband on a walk down the road to the nursery where there is a delightful cafe for breakfast. Both sons messaged him from afar which made him happy. Were my father still alive I would have given him a bar or 2 of dark bitter chocolate as this was his favourite. 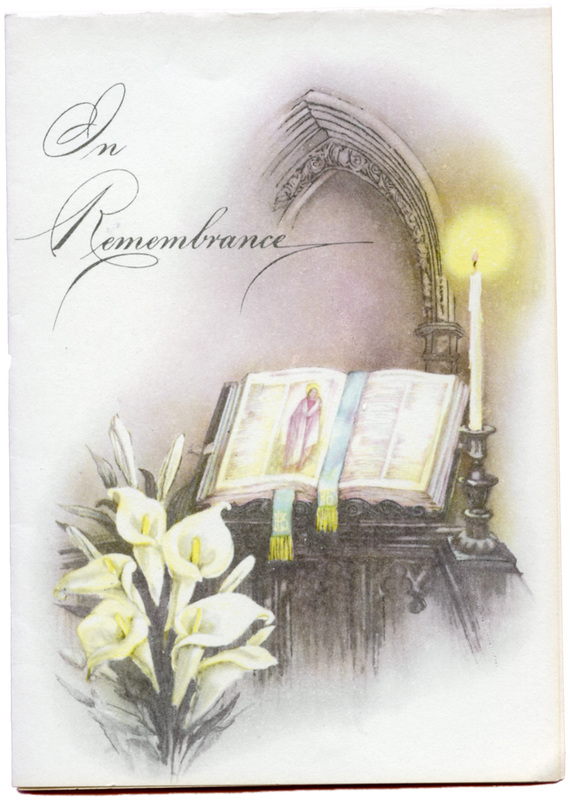 Sweet remembrances through the generations including a gift of chocolate. That never fails to hit the spot for me too! Beautiful. It’s meaningful that you knew when you were looking at your dad for the last time and got to say goodbye. I’m sure that helped both of you with that incredibly difficult transition. Like yours, my dad didn’t live a long time between his cancer diagnosis and his death, just 7 weeks. But we got to say goodbye (I did anyway, goodbyes were not really his thing. Words didn’t suit his purposes much.) and I don’t know if it helped him but it helped me through losing him. Your dad is so proud of who you are, I feel sure. Our fathers had significant similarities, both being reticent. Whether it was his personality or the imprint of his Swiss/German heritage, my dad too rarely if ever expressed approval or emotion of any kind to me. “Words didn’t suit his purposes much” hits the nail on the head for both our dads. I appreciate your insight here, Debby – thank you! I love reading about your family. We don’t share a religion but we share so much else. It’s a reminder how much more alike than different diverse people are in what matters. What a beautiful tribute to such a loving father. I praise God for the privilege to call him my spiritual Dad. If I didn’t have him I would never have known what a loving father would have looked like. I remember Sunday mornings before going to church dad playing the piano he and I singing Fill my Cup Lord. His great warm smile he and mom enjoying Shanti and I. Me such a young mom. It was there that God started to form me as the Christian person I am today. I remember when he started getting a big stomach that mom changed his diet. He lost weight but not the stomach. That’s mom made the appointment with the doctors. I miss them sooo much. I love the great memories and love they gave me. 38 years this would have been 39. Thank you Marian of this great tribute. Thank you for speaking here as our parents’ other daughters. Remember that blog post about you and your children! I must say that in the time between my childhood and your coming on the scene about 20 years later, our parents, particularly my dad, had learned many valuable lessons about parenting. Again, I appreciate this memorable tribute, Gloria. I am so glad your life was forever changed by my dad’s positive influence. Marian … Your dad and mine had many things in common. My Dad also loved long walks in the woods – and in the desert when he moved to Vegas. He played his guitar every day, instilling my love of music … and bought me a piano. He also was intellectually curious and a hard worker. We are so fortunate to have had such wonderful role models in our lives. And we both became teachers, purveyors of knowledge – and wisdom, we hope. Probably the similarities are more a function of a shared era rather than geography. No wonder they are sometimes called “The Good Ole Days”! We loved Italy, especially Florence and Tuscany. If I had to choose anywhere in Europe for a return visit it would be Italy – oh, maybe Provence. I’d love to return to Italy and to Paris, my favorite European city. Wonderful places. The only time I’ve seen Tuscany was in the movie “Under the Tuscan Sun.” It sure looked like a beautiful place. What you are describing is a tribute that left you speechless, high praise for this writer, Tracy. My relationship with my dad was complicated, as many are, but these memories have been distilled from the best between us. Thank you for your kind words. I’m glad they moved you and brought back memories of your own father. I remember some flashback scenes from your family in “Toward Daylight,” some even involving mischief – ha! Our relationships were also definitely complicated. My father is still alive, not yet very old, and healthy. We still have time, I hope, to make good memories. We’ve been though a lot of tragedy and drama–humor and “mischief” have helped us weather some of those storms. Sweet or maybe that should be bitter-sweet memories of your lovely father! And apparently the capacity of his great heart transferred to you, which you in turn express through books and blog posts. I’m glad this piece t struck a chord with you. Such a terrible illness. It took my father too although he suffered for many years. Lovely memories. Illness and death happen all the time, but that doesn’t mean our own sufferings are not unique. Yes, we hang on to pleasant memories for sure, Marie! It has taken me a long, long time to get to this place. In some measure, I suppose, I may have arrived at closure. Is that possible? Thanks always for looking at my life so wisely from the other side of the screen, Elaine. I must have been traveling when this post hit the airwaves, Marian. Thanks for bringing it to my attention now. I agree with Elaine’s comments above. And I know that my own relationship with my father healed in the weeks and months before his untimely death, which became one of the turning points of my life. I remember and can identify with the anger-of-the-father” comment near the end of one of your book’s chapters. Such passion, I think, can fuel energy of all sorts in the lives of sons and daughters. Thanks for returning here to reminisce and feel the healing once again.